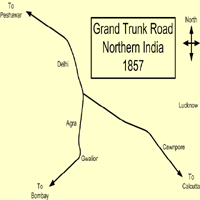 Grand Trunk Road or GT Road is South Asia's oldest and longest road. It covers a distance of 2,500 kilometers. It was initiated in 3rd century during Maurya Empire. Later extended in 16th century by Sher Shah Suri who was the founder of the short-lived Sur Empire in northern India. For several centuries, it connects our native countries. It starts from Bangladesh, passed through north India, into Peshawar in Pakistan and goes up to Kabul in the Afghanistan. Kolkata, Bardhaman, Durgapur, Asansol, Dhanbad, Aurangabad, Dehri-on-sone, Sasaram, Mohania, Mughalsarai, Varanasi, Allahabad, Kanpur , Kalianpur, Kannauj, Etah, Aligarh , Ghaziabad, Delhi,Panipat, Karnal, Ambala, Ludhiana, Jalandhar and Amritsar. In Pakistan it passes through Lahore, Gujranwala, Gujarat, Jhelum, Rawalpindi, Attock District, Nowshera, Peshawar and Landi Kotal.